Hawaii Botanical Wedding Inspiration. When we think of Honolulu, images of blue water, brilliant sandy beaches, and shady palm trees come to mind, but this styled shoot fosters a new vision entirely. With its botanical inspiration, this wedding style is wistful, romantic, and elegant – just one more beautiful reason to dream of Hawaii. Every single detail in this shoot is touched by florals, bringing some of Hawaii’s natural beauty indoors. From the first romantic sign, we see orchids, roses, and greenery that abound with color. The invitation features a balance of color with a white invitation card and burgundy envelope that matches with the palette of the day. A wild, romantic arrangement full of red and white orchids, roses, greenery and more creates a stunning centerpiece for any table. The bride’s look is centered on both moody and subtle colors that, together, create a graceful and sophisticated style. She sports a dark wine-colored lip, while her eyes are dramatic and alluring. 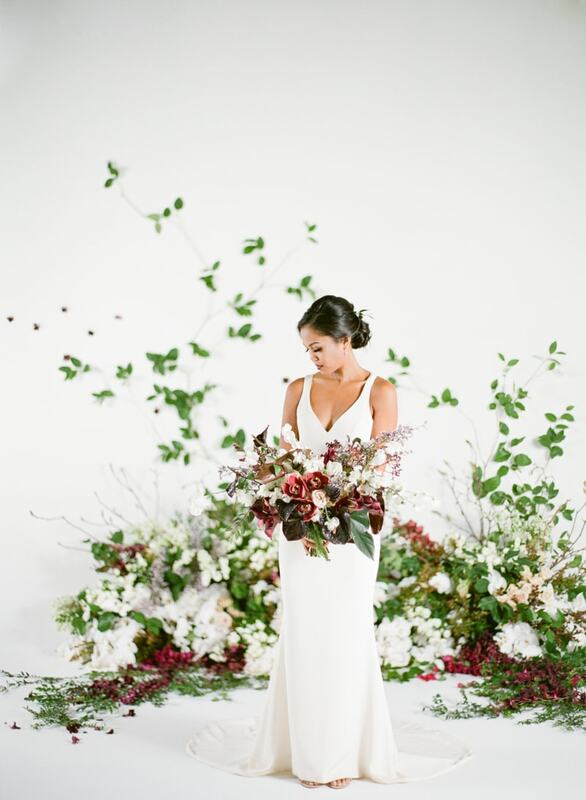 The team uses heaps of florals to create a dreamy backdrop that’s perfect for a ceremony. The crawling greenery on the stark white walls evokes a whimsical appeal, resembling butterflies taking flight. And a small table in front is an ideal centerpiece to the couple’s vows. With her hair styled in a classic low updo, the bride shows off the sheer back of her gown, which features a seamless sheath silhouette and train. Her accessories include simple dangling earrings, an accent of greenery in her updo and of course, a mega-watt smile. In her beautiful white gown, she presents her bouquet in front of the enchanting floral backdrop. The blooms offer cohesive color and texture throughout. She pauses on a small wooden stool, looking picturesque as she casts her eyes down towards her bouquet. 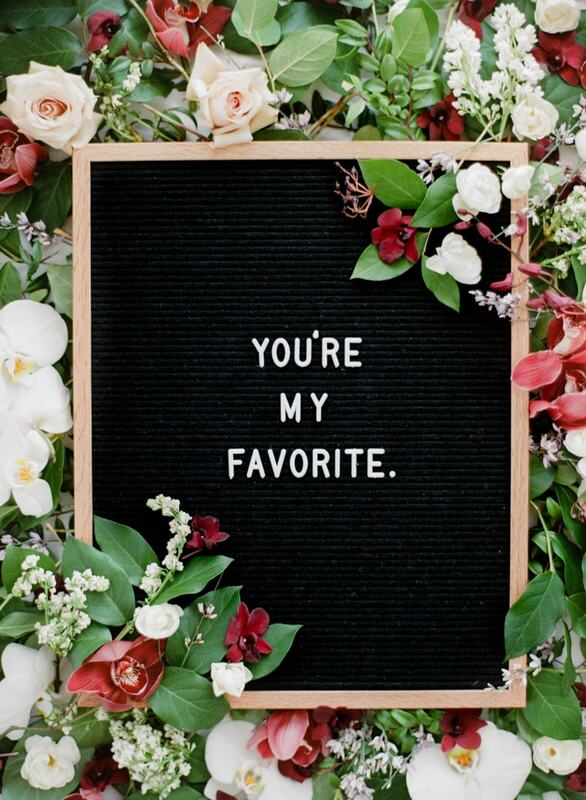 The styled shoot ends the same way it begins with a romantic sign. This time, it features a quote from E.E. Cummings that certainly fits the theme. This styled shoot in Honolulu is a destination wedding dream come true, thanks to its creative use of florals and timeless bridal fashion. Leave the beaches, sand, and sunscreen for the honeymoon – this wedding style is worth staying indoors for.